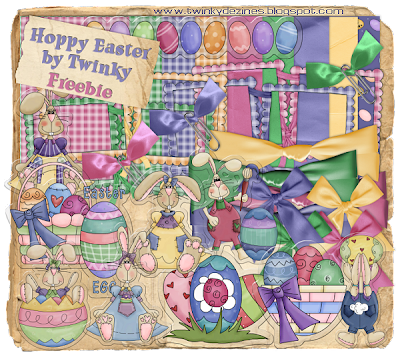 Twinky Dezines: Hoppy Easter Freebie! I'm back with another Freebie, an Easter kit, just in time for your Easter tags! Its called Hoppy Easter and you can get it Here and please leave some Love! Thank you so much, it's adorable!! I'll have to check out the little guy in the right hand corner, looks interesting, but don't have my glasses on!! lol Thanks again! What an adorable kit! THX so much for sharing! This is such a cute tag kit - thanks so much for sharing it with us! Thanks for the sweet kit! It looks like a pile of darling stickers...which every kid loves! Thank you so much for this Freebie. I want to let you know that I posted a link to your blog in Creative Busy Hands Scrapbook Freebies Search List, under the Easter post on Apr. 03, 2009. Thanks again. Beautiful kit - thank you for sharing ! What an adorable kit! Thanks much for sharing! Thank you very much for sharing this beautiful ester kit. Have a nice week ! So cute! Thank you so much for the freebie! Oh I love this, thank you so much for making it a freebie. A girl can never have enough scrap kits!! Adorable - thanks so much for sharing. This is a beautiful set - so Spring-like. Thank you for sharing.